Today I’m here to talk about the process of getting a pattern to fit how I prefer. On Monday I’ll have a full review of this pattern 1942 Two-Piece Dress from Eva Dress Patterns posted on The Curvy Sewing Collective, but over here I’m writing about making muslins! This pattern comes with sizes grouped together. So you can either get bust sizes 32-38 or 40-46. I purchased 40-46. For my first muslin I cut a size 40 for the shoulders graded into a 42 at the waist. I thought this looked pretty promising over all. The shoulder cut in a bit closer than I wanted, but otherwise the big issue is the center front lines are no where close to meeting! I’d expected that over the bust was a bit surprised by the waist. I figured, no worries. I knew I was going to do a full bust adjustment, this just confirmed that was the right next step. Ack! 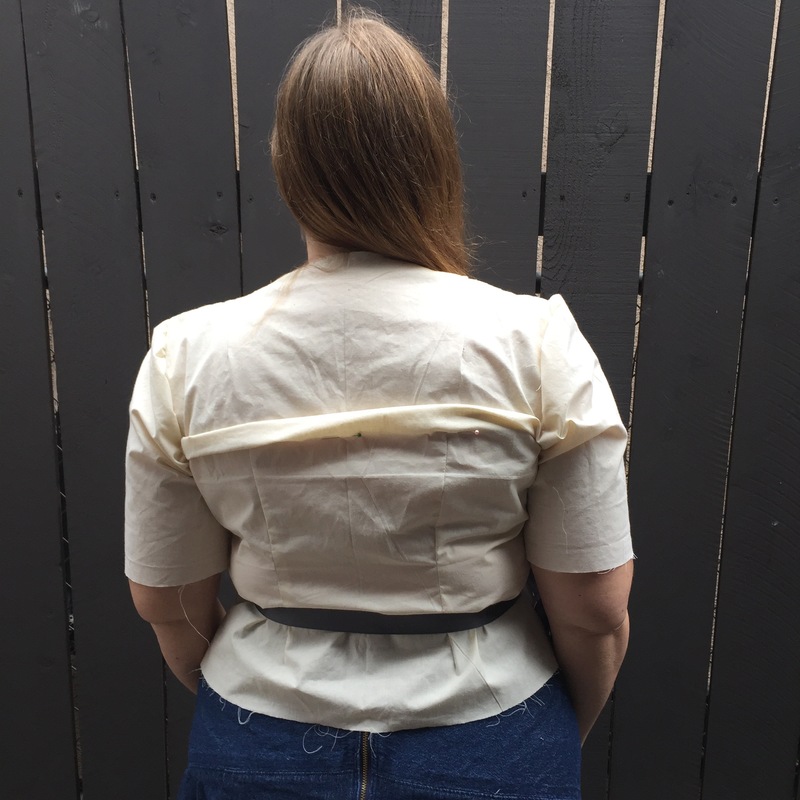 Okay, I did a 1.5 inch full bust adjustment to each side and now the center front lines aligned and the waist looked nice, but the blouse had too much length! Way too much! This is also how I saw the sleeve caps had tons of extra height. I also saw how the back was much too long as well. Though this is a common issue I have with patterns. At this point I was frustrated. I’d done what you should do to add room for the bust, but it didn’t work out like I’d planned. I almost quit. Then I went to an online sewing forum through Ravelry and asked for feedback on how I should proceed. The consensus seemed to be that I should go back to version 1 and rethink how to add width. I studied the shoulder pleats and figured out where the bust apex was on the original pattern. Then made the decision to gasp! just add the width at the side seams. I think it worked out pretty darn well. Instead of grading the pattern from size 40-42 between the bust and waist, I went ahead and traced off a size 42 for the entire front piece along the side seam. Then for the side with the tie I traced the neckline starting with a size 20 at the shoulder and a size 46 at the tie. This still didn’t add enough width, so I also slash and spread the pattern by 1 inch. To accommodate the slash and spread as well as the too wide shoulders I added 2 pleats to the shoulders. As you can see now the tie actually reaches fully to the side seam as in the original pattern envelope art! Lastly I tossed my sleeve pattern piece with the large bicep adjustment and traced the size 40 sleeve cap with size 42 bicep. 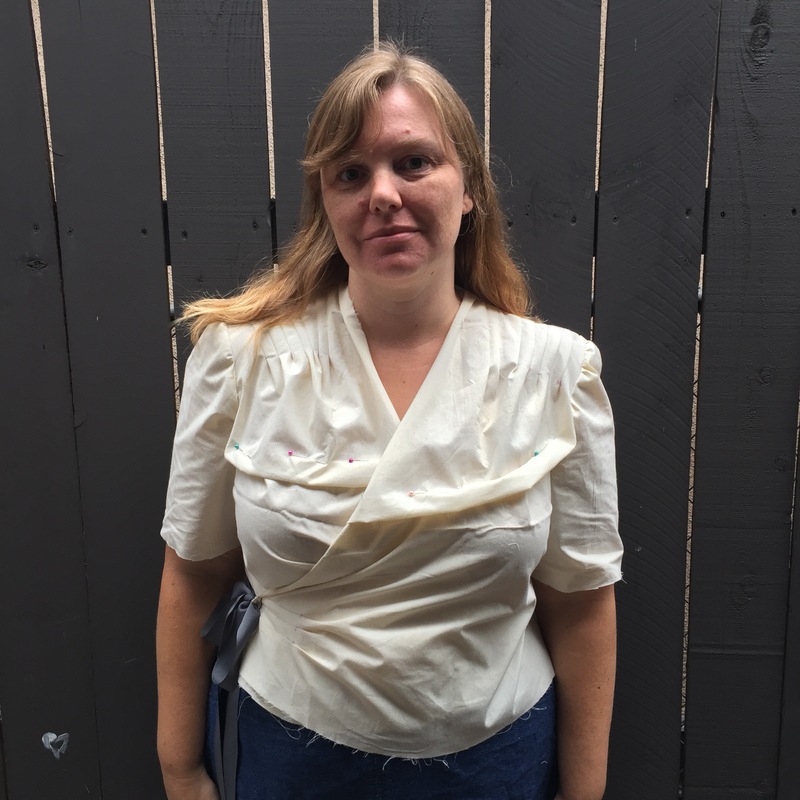 Is the finished blouse perfect? Nope. But it fits a lot better than either of my muslins. The sleeves are a bit long. So next time I’ll take some length out above the elbow pleats. But that is such a minor alteration to make compared to the other fit issues! To be fair I did not muslin the longer sleeves, so totally my own fault! 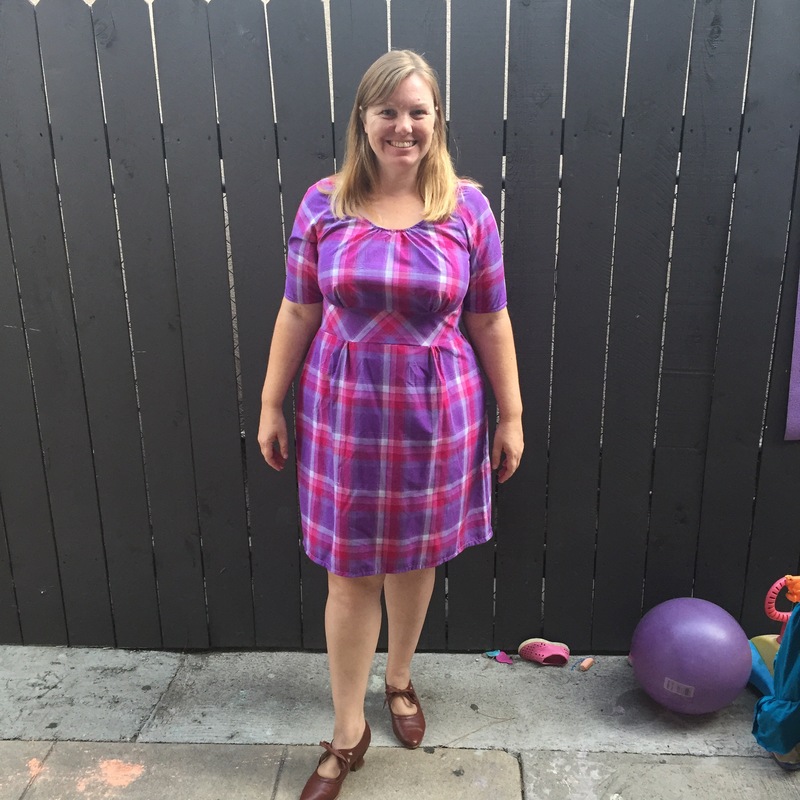 The fashion fabric is some lovely Swiss dot voile I picked up at Michael Levine’s during the same visit when I bought the pink/purple plaid used to make my Dahlia dress. It is so soft and light and lovely to wear. Just enough to provide nice coverage on a warm day. This project felt like a lot of work, but I am overall happy with how it turned out! I’m not making a lot of pieces right now, so it feels good to slow down and embrace the process. Let’s talk about Colette. Their pattern block is somewhat less than desirable for a large portion of the sewing crowd, but several years ago there weren’t as many competitors on the indie scene. Like many others I purchased a few Colette patterns. I loved their vintage inspired esthetic. Then I made these patterns and they were pretty much flops. I blamed myself. As a largely self-taught sewer I figured I just didn’t have the skill. Now I know that I am not alone! 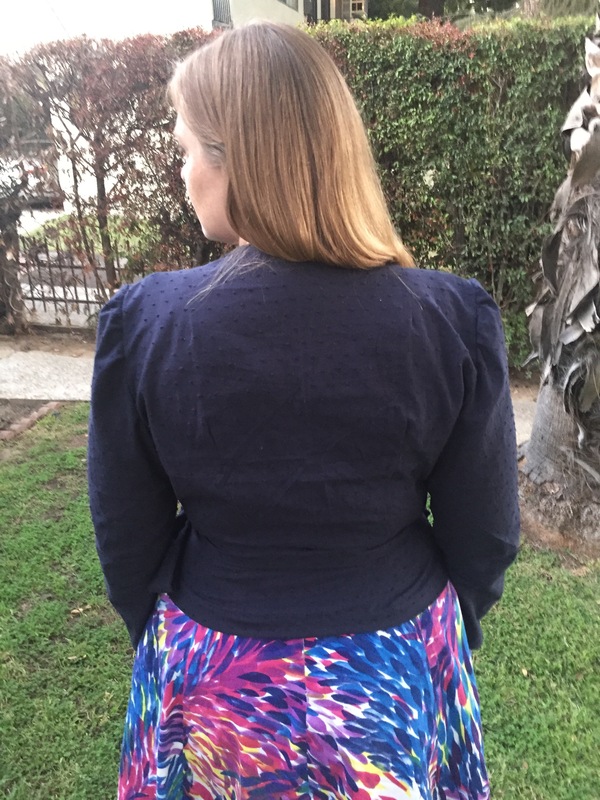 Colette patterns are notorious for their wide shoulders, odd sleeves, and flat butts. Ahhhhhhhh. It all makes sense now. I am by no means an expert, but I think I do okay at getting things to fit. I like to experiment, but last year I got really fed up. You see, I attempted to make Colette’s Dahlia. Gosh I love the way the pattern looks on the original model. 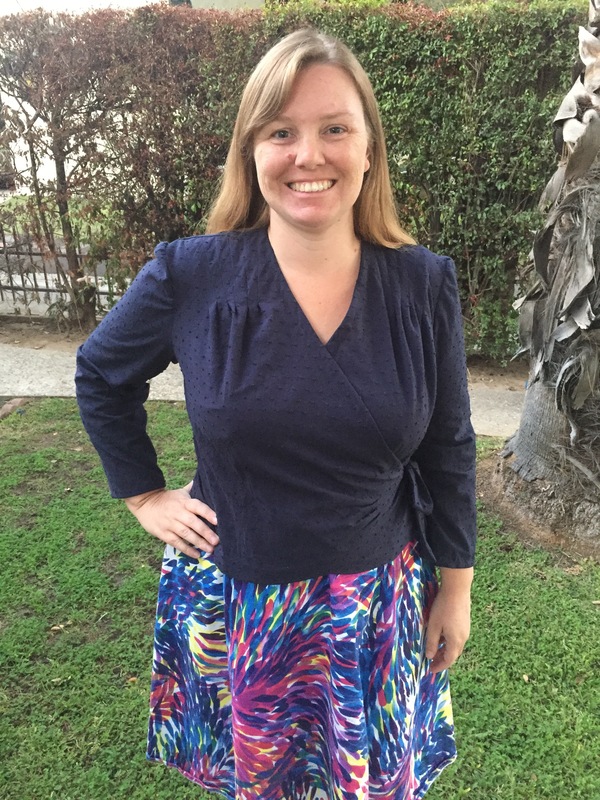 I’m linking the sew-a-long because Colette has changed the pictures on their site. But making the pattern proved to be very frustrating. I’d searched pattern reviews and only found nice versions! But when I put on my finished dress the shoulders were so big they stood up and touched my ears. I was dismayed. I was upset. 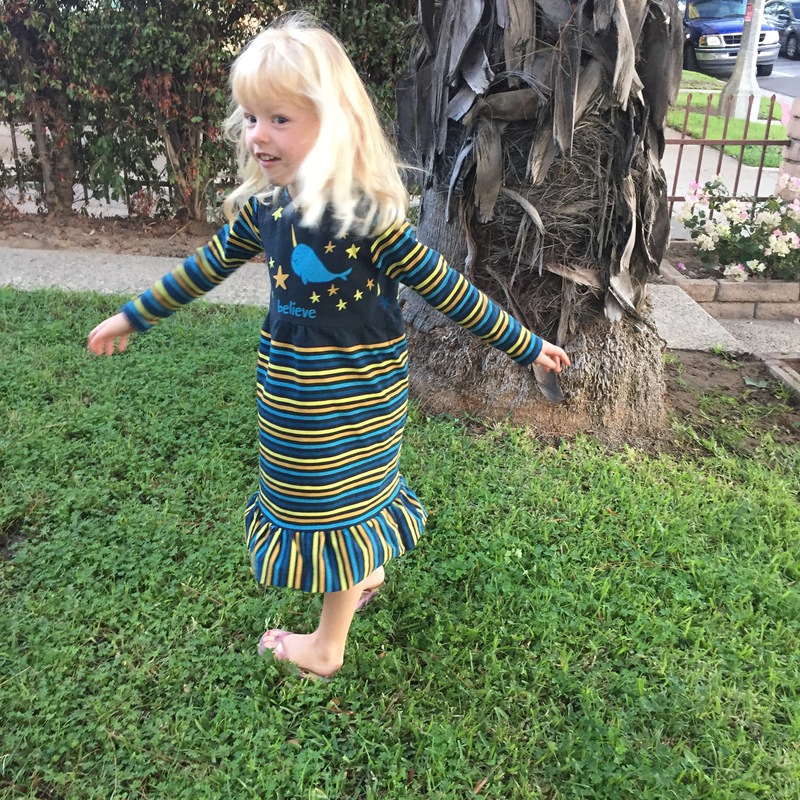 I knew someone who had made the dress and her’s turned out great, but mine was unwearable. So I gathered the neckline, turned the binding under, and then stitched it all smaller. I still hated the dress. Pissed off and disappointed I threw Dahlia in a corner and forgot about it…until today. 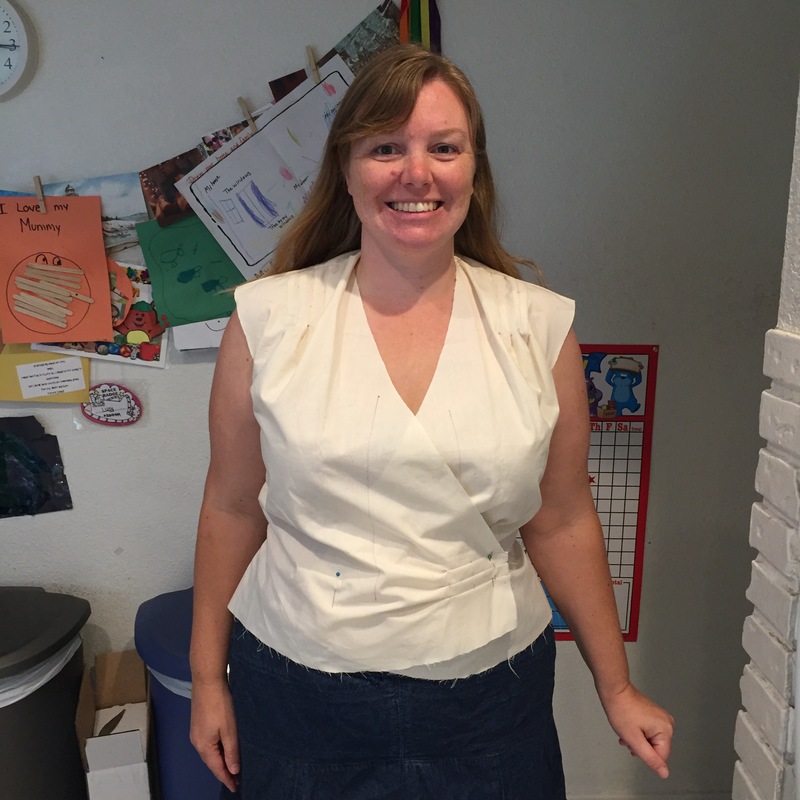 I pulled it back out because I was going to use the skirt fabric along with my leftover yardage to makes a blouse! But I thought I should try on the dress one more time and photograph it. I put the dress on and well, it looks pretty good! I mean sure, it’s not perfect. The neckline looks pretty crappy, but a cardigan is going to hide all those sins. Still a little wrinkled in these photos, but not bad over all. I remembered I really liked the skirt and waistband! I have zero memory about what size I made or what alterations I made to the pattern. None. Oh well. I’m unlikely to try this pattern again anyways. I do remember this fabric. I’d bought it at Michael Levine’s for maybe $5/yard. It was labeled 100% cotton, but it probably a cotton/poly blend. I really need to throw a slip on underneath so the fabric glides more freely! But another reason this fabric stands out in my mind is because as I was watching Modern Family I saw Cam wearing a shirt from the same fabric! For now I’m just happy to come to peace with my version of Dahlia. It’s not what I originally wanted, but far from the wreck I saw in the mirror last year. Did you know there is a whole world out there of specialty printed fabric organized through Facebook groups? No? I wasn’t either! One of my parenting group friends started posting pictures of her daughters in all these cute outfits so I asked her where she found the fabrics and now I’ve been sucked into the Facebook group scene! So far I’ve only ordered through one company, Sahara Fabrics. It is similar to ordering through Spoonflower in that there are a bunch of prints posted that you can order, but to cut down on the costs they only offer a select number of designs at one time. The companies keeps just a small stock of any item and generally once it is gone that’s it. Some of these companies specialize in science themed fabric, fan art fabric, and fabric to make knock off Lularoe leggings. Many of these companies also offer fun and different PUL fabric for the cloth diaper scene (oh if only I’d know about this when we were cloth diapering!). Sahara stocks a lot of cloth diaper supplies, but they also offer a lot of cute cotton/lycra prints and some bamboo knits as well. Most of the designs are suited to kids, but a few will appeal to adults too. The fabric for Lu’s dress came to me through a mix up at the post office. I’d ordered this print for my narwhal obsessed friend who welcomed a son earlier this year. But then the package was lost in the great and powerful USPS system. Sahara and I waited the required number of days to declare the package lost and then Sahara graciously sent me out a new package. Well imagine our surprise when the original fabric bundle re-surfaced and arrived at my doorstep! Sahara told me to keep the fabric and so I got a little bit of narwhal fabric to keep. Lu’s dress is cut from 1 Narwhal Magic Panel. This is a specialty product in which there is a graphic print and a coordinating print all on one length of fabric. The panel measured 30 inches tell x 58 inches wide making it just less than a full yard of cotton knit. I sat on it for a few months while trying to figure out what I could make from it. But as the weather has turned cooler at night I realized Lu really needs long sleeved nightgowns and dresses. This could be both depending on her mood. 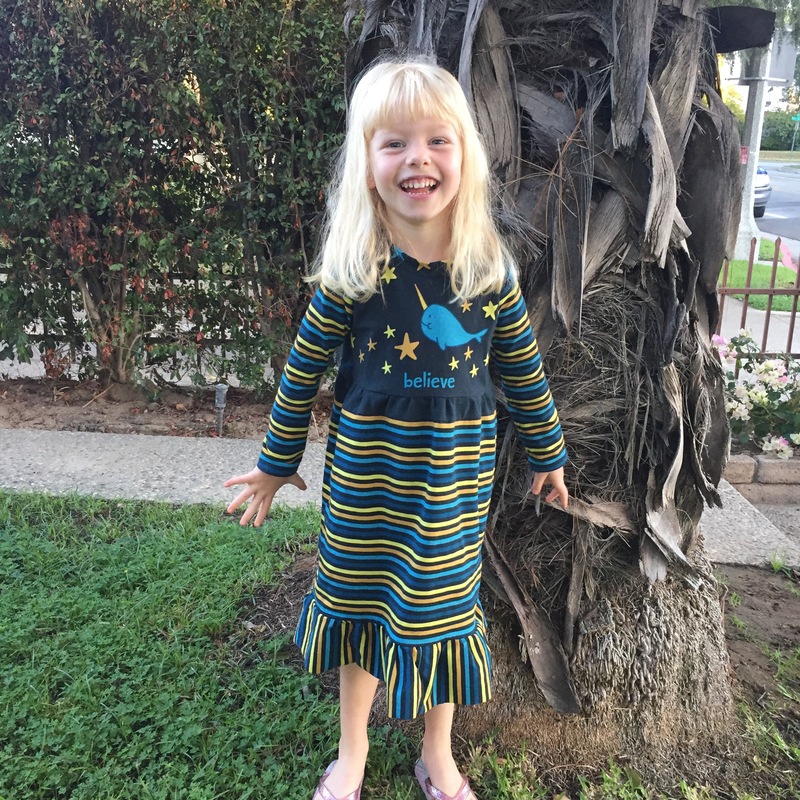 I used all but a few scraps to make this dress. The front was centered over the narwhal. 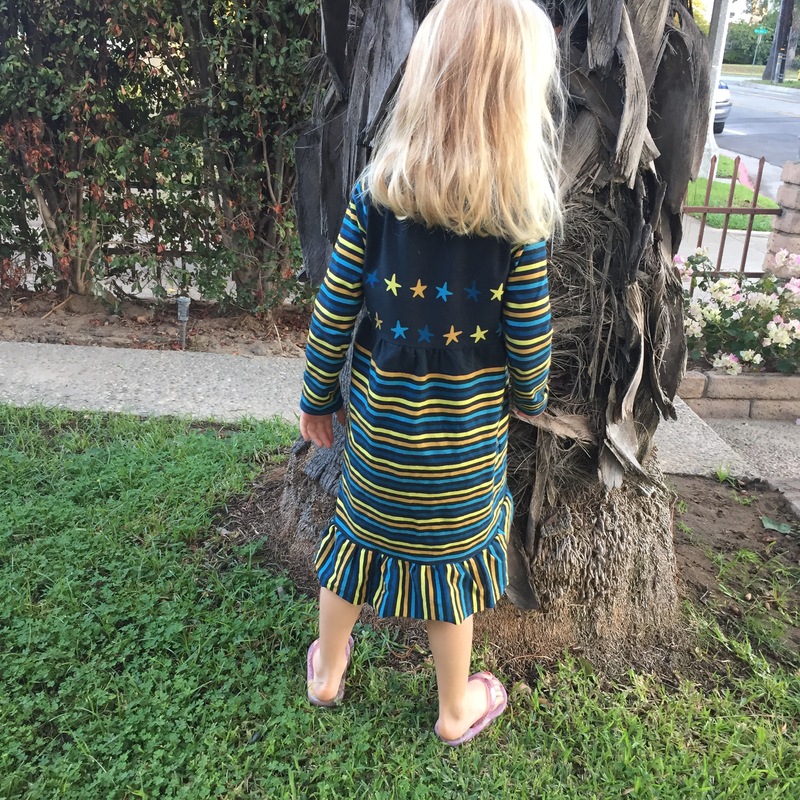 The back was lined up with the first two lines of stars. The neck binding was from the bottom row of stars (I think mine was missing the very top row above the narwhal). And then I cut the sleeves, skirt, and ruffle from the striped fabric. The skirt is a little on the narrow side and Lu and I both thought the length was not quite enough. So at the very top of the skirt I added a thin strip of solid navy that was from just above the narwhal on the panel. After cutting the main pieces I had this awkward narrow strip of stripes that I cut into smaller segments then sewed end to end to make a ruffle. It’s the kind of detail that I think really makes the dress more fun! 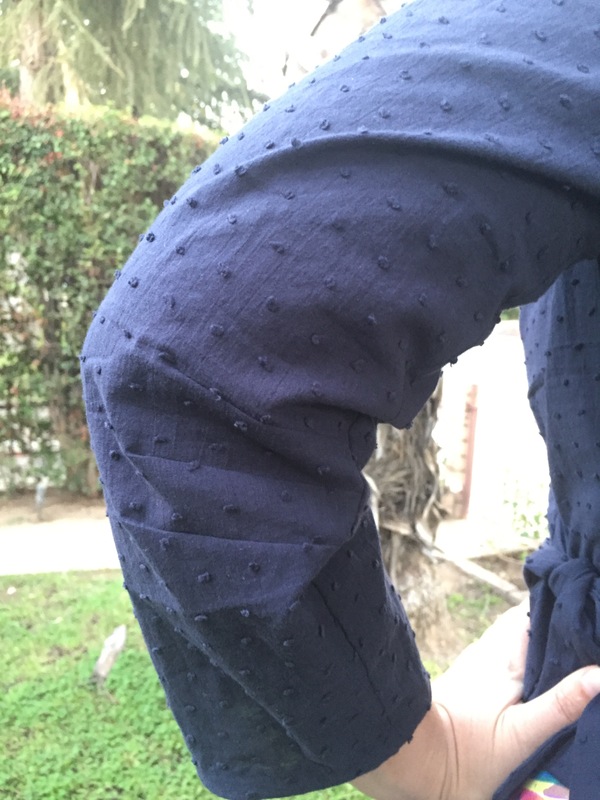 The base pattern is Made by Rae’s Flask Back Skinny Tee. All I did was cut it shorter so I could make it into a dress. I love this tee pattern. So simple and basic and adjustable. All the traits I love in a hack-a-ble pattern! 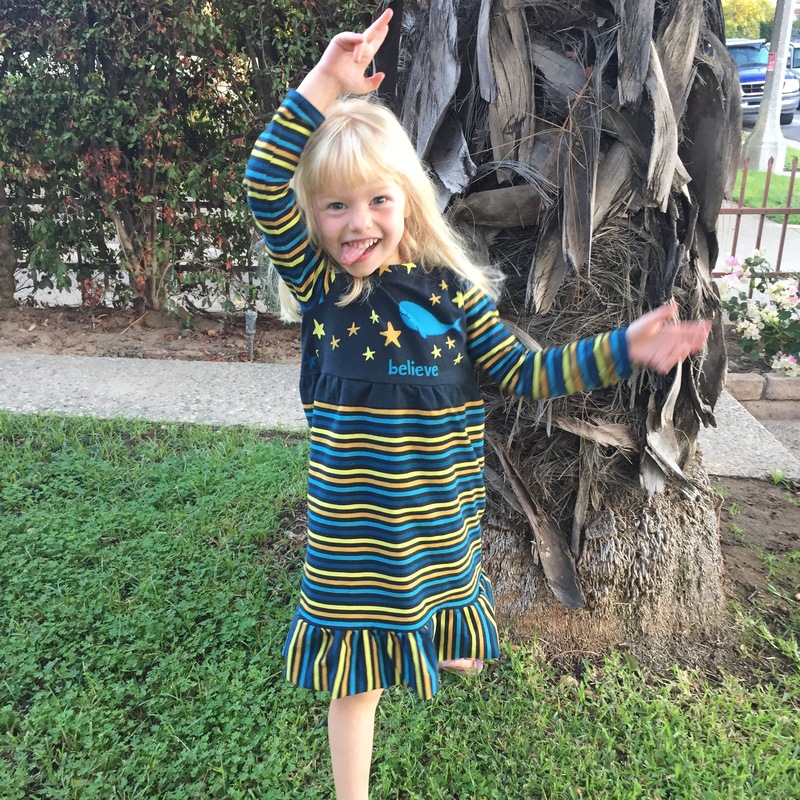 And clearly Lu loves the finished dress! She took it straight off the sewing machine to wear to bed last night. Such a great feeling as a mom!